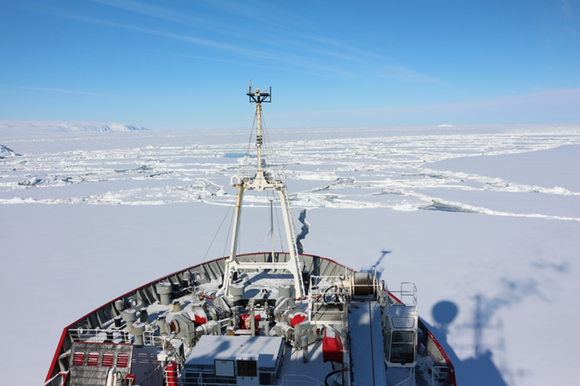 In January-March 2017, I was involved in an oceanographic cruise led by Jean-Baptiste Sallée (CNRS researcher at LOCEAN in Paris) in the Weddell Sea aboard the British Antarctic Survey vessel, the James Clark Ross. The Weddell Sea is a unique region responsible for 50 - 70% of the formation of deep water in Antarctica, motor of the global thermohaline circulation regulating the Earth's climate. The Weddell Sea also harbors rich ecosystems associated with the seasonal sea ice dynamics (krill, copepods, fish, birds and marine mammals). 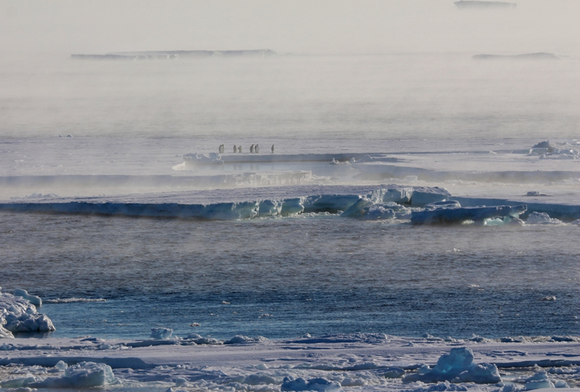 However, this sector remains under-sampled and little is known about the oceanographic and biological processes taking place in this region due to compact and extended sea ice making the access difficult even in summer. The cruise represented a unique opportunity to study the ecology of marine top predators by equipping them with satellite-relayed data loggers, in a region where little is known on their movements, foraging activity and their preferences in terms of oceanographic conditions. 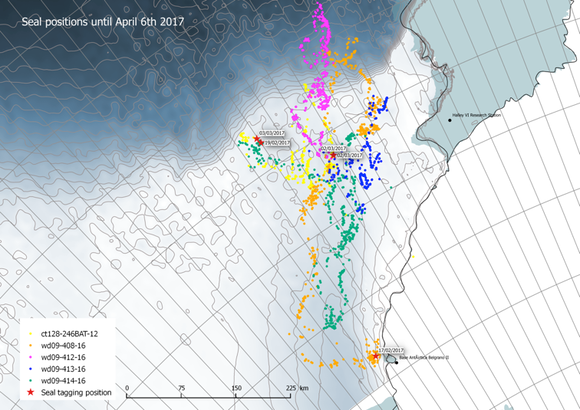 The cruise was part of the WAPITI project (Water-mass transformation and Pathways In The Weddell Sea: uncovering the dynamics of a global climate chokepoint from In-situ measurements) funded by the European Research Council (ERC). WAPITI aims to understand how and where water-masses are pre-conditioned and transported on the Antarctic shelf, before coming into contact with the ice shelves: an highly sensitive process ultimately controlling the rate of melt of the Earth’s largest ice reservoir. Associated with this cruise, we did opportunistic deployment from the R/V James Clark Ross of five Argos tags coupled with diving recorder and a CTD miniaturized sensor on one emblematic specie of pinnipeds, major consumer of the ecosystem of the Antarctic sea ice the Weddell seals (Leptonychotes weddellii). 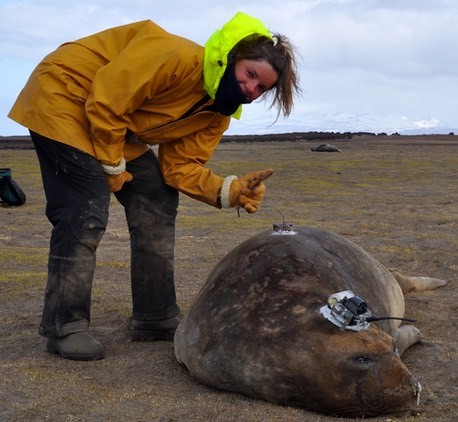 Such deployment coordinated within the framework of the physics-based WAPTITI will allow unique interdisciplinary research: (i) acquiring essential information on the feeding ecology of Antarctic seals, where only few studies are available, and (ii) acquiring a vast amount of information on the regional water-mass seasonal cycle and circulation acquired from instruments deployed as part of the WAPITI project, and valuable hydrological data under sea ice in late summer, autumn and winter from the CTD profiles recorded during dives of this predator. 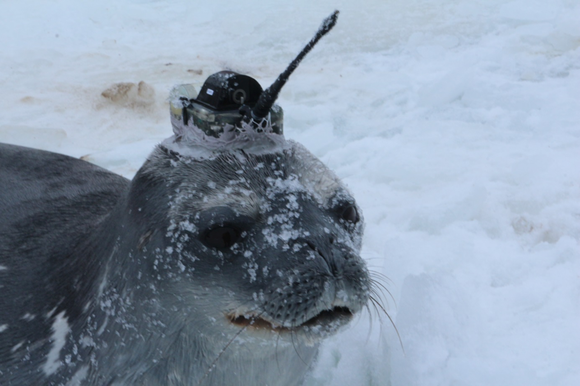 The study of the seal diving behavior under sea ice combined with simultaneously recorded hydrographic profiles will first highlight preferred feeding habitat in terms of oceanographic conditions. Secondly, this telemetry monitoring will help to quantify the role of hydrological and sea ice conditions on the abundance and availability of resources in the peri-Antarctic shelf, improving our still very patchy knowledge on ecosystem functioning under winter sea ice.